>Receive $10 OFF the New Client Special* (4 Weeks Unlimited) at Pure Barre Vancouver. *Usually $99, NOW ONLY $89! Also available: New Mommy Special - 3 Months Unlimited for ONLY $450 (sold in store only). Pure Barre is a total body workout that utilizes the ballet barre to perform small, isometric movements which burn fat, sculpt muscles and create long, lean physiques. The Pure Barre method has exploded in popularity, due to its extremely effective technique which transforms the shape of a woman’s body in record-breaking time; friendly, high-energy atmosphere; and fun, motivating music. 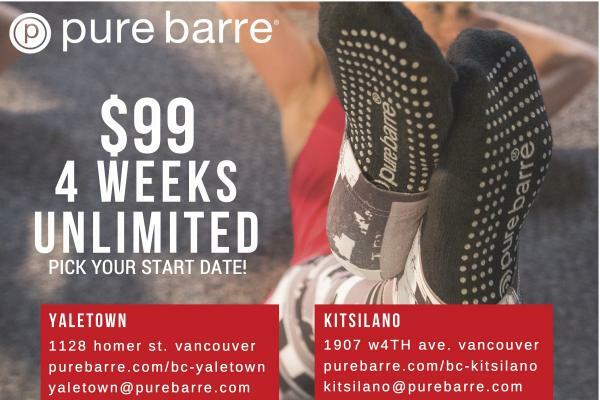 Visit www.purebarre.com/bc-kitsilano for more information and show your card in-studio to receive your discount.